A new born child arriving in your life is life-changing. Suddenly the onion-like layers of selfishness and pride, that make you think you're the center of the world, begin to fall away. Your child becomes the center of your world. Now, say that child arrives three months premature and weighing less than two pounds. That's what happened to The Answer's main lyricist and lead singer Cormac Neeson and his wife in 2015. It was tragedy befitting darkness and despondency, but also critical emotional and personal self-reflection. 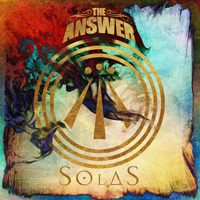 It's the kind that presents itself in The Answer's new and sixth album, Solas, which is Gaelic for light. Now, I do not intend to be cheating or lazy, but Solas is best explained by the press release and biography of The Answer supplied by Napalm Records. Next to this, my words that follow will be merely anecdotal, a footnote. Suffice to say, this is not The Answer of the last five albums. 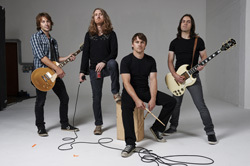 The music within is not necessarily their blues and psychedelic touched, hard and heavy rock. The band, through a period of reflection, catharsis, and healing, reached into their Northern Ireland, Celtic, and Gaelic roots for musical inspiration and energy. But Solas is not some Irish folk album. It is a rock album, tempered and colored by these things. You'll hear more acoustic guitar, some mandolin, more cinematic and atmospheric tones, and even some Gaelic and Latin phrasing in the lyrics. Good examples include the lightly up beat In This Land, the more delicate Thief Of Light, the shimmering and brisk Battle Cry, and the haunting motif of Being Begotten. Alternatively, The Darkness is a rock band and they rock with Untrue Color, the brisk and sharp Left Me Standing, and the lightly blues-infused Demon Driven Man. While lyrically, most all the songs reflect Neeson's mindset through the struggles past and present, I think Tunnel has to be the most somber and self-effacing of them. It's seems a summary of his dark journey, that only the light he seeks in Solas that can heal his heart and soul. To return to the start. From the struggle through and recovery from personal tragedy, Cormac Neeson and The Answer have created Solas, possibly their finest album of their career. It's a watershed moment and a game changer for the band. Quite recommended. From the struggle through and recovery from personal tragedy, Cormac Neeson and The Answer have created Solas, possibly their finest album of their career. It's a watershed moment and a game changer for the band. Quite recommended.